At NSP, we go a step beyond in the design, technology and manufacturing techniques used in all our boards. 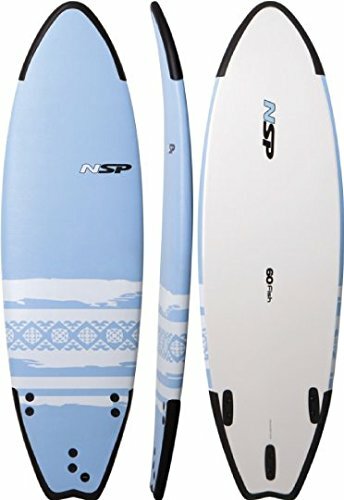 When you buy an NSP surf or stand up paddleboard (SUP), you can be sure that only the best research, development, design, mnufacturing and customer support goes into everything we do – our goal is to ensure your experience with NSP, both on and off the water, is the best it can possible be. The NSP Soft School Fish in our proprietary soft surfboard construction is a great option from the beginner surfer looking to take their surfing to the next level, or the weekend warrior looking to add a fun fish to their board collection. This wide template fish shape with generous rocker and pulled in nose and tail templates allows riders of all skill levels to have fun. With the full soft deck and rails, rubber nose and tail bumpers, and FCS compatible fin system (Soft fins included), this is the perfect option for everyone. Our P2 construction starts with a water resistent molded EPS blank with multiple wood stringers for rigidity. We then vacuum bag layers of fiberglass and laminate using high quality epoxy resin. Wrapped in a soft, forgiving foam on the deck and rails (no need for messy wax) and a high density slick bottom. Dimensions: 6-Feet Long X 20 7/16-Inches Wide X 2 3/8-Inches Thick.